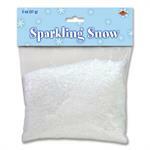 Always a best seller, Iridescent Snowflake confetti is elegant and ethereal. Confetti in Christmas Cards is a great way to stand out from the rest. Snowflake Confetti. White, Iridescent, and Opalescent!